We all knew the communities affected by the UK Riots would feel the after-effects for a long time, however walking around Brixton the past couple days gave me a poignant reminder of the potentially long-lasting and worsening devastation caused. 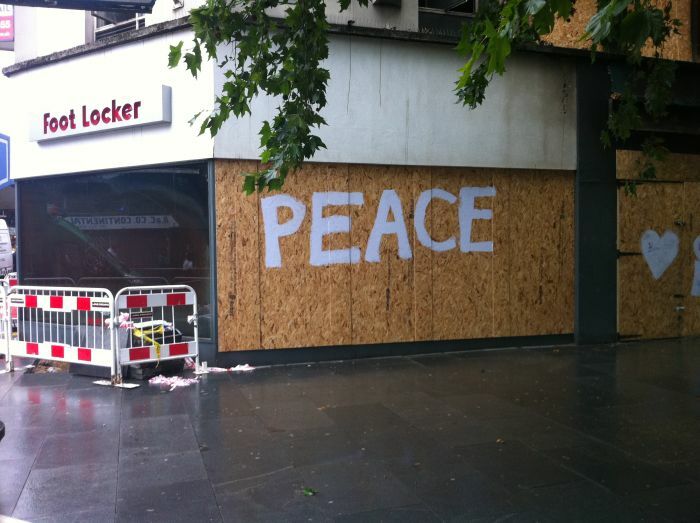 Footlocker was looted and set alight by the rioters on Sunday 7th Aug as reported in the Global news headlines. It was put firmly out of business. 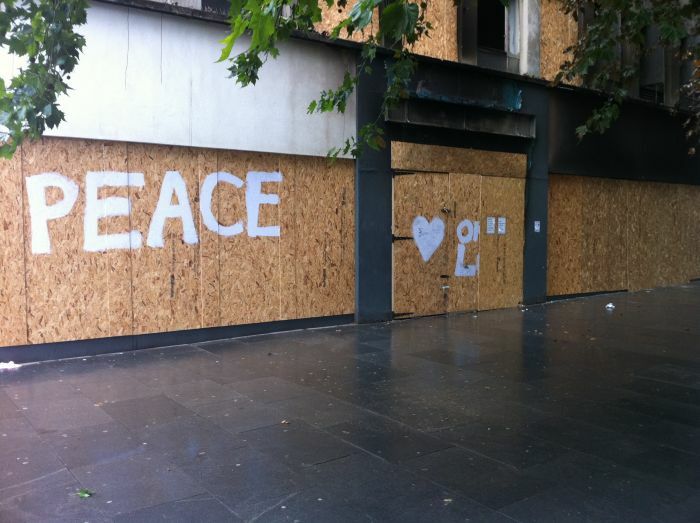 Local spokespeople gave me accounts of how it’s staff were standing outside the shop in tears on Monday morning, after seeing the vandalised, burned-out shell of what was. Then, another wave of devastation surfaced – Tuesday 16th August at 1am a 2nd fire began to rage and it is still smouldering as I write. I visited the area yesterday and was shocked at the sight of the gutted, smouldering building, alongside the heavy police/fire presence – the area was at a grid-lock. I re-visited the area today and spoke to a Community Police Officer. He informed me that he was first onto the scene on Tuesday. As he accounted the past few days of trauma, he shook his head in empathy of the deep sense of betrayal and cursed short-sightedness (toward the rioters) by local residents and business owners, for whom this is more than a mere temporary disruption. The High road and the Tube station was closed on Tuesday and Wednesday and a major section of the Brixton/Electric Avenueshopping area/residential above-shop flats is closed. The physical furore of the fire, plus the electrical health & safety concerns have shut down a significant cornerstone of Brixton High Street/Market. People have to be re-housed. Businesses cannot trade. Traffic is horrendous. It is one big crime scene. Nobody can tell whether the 2nd fire was started intentionally however the general whispers are that it was a freak after-shock caused by the fires and building destruction from the night of the 7th. 1 ½ weeks after the Brixton Riot, it feels as though it’s getting worse. Brixton Riot’s Aftershock (the 2nd Footlocker fire) bears the intensity & pattern of its geological event name-sake; its a fresh and more serious sore on top of an already deeply traumatised wound. A business owner outpoured to me that on Wednesday alone – some two days after the 2nd devastating fire at Footlocker – 5 fire engines were parked on Electric Avenue/Railton Road all day. She vented about the unfortunate drain on vital public resources resulting from the short-thinking actions of the rioters, also her firm belief that convicted rioters should be sentenced to work on the clean up/ repair of the properties they & their fellow gang members have damaged. Fair point? I can only describe the spirit of Brixton at the moment as solemn – it’s lost the liberated feeling I’d relished since moving here for 7 months in June 2010. There is now an extreme sense of sadness and disgust; Brixton is mourning. I can only hope that the government makes use of it’s Riot Taskforce Resources (my phrase, on account of a lack of an identifiable body) to get the area back onto it’s feet aesthetically, commercially, culturally and most of all, morale-wise. Away from all the fist-shaking-top-lip-corner-raising PM speeches, also the happen-to-have-a-tv-crew-with-me-front-door-kicking-in & make-an-example-sentencing, I still haven’t heard any strategic plans to re-build communities. 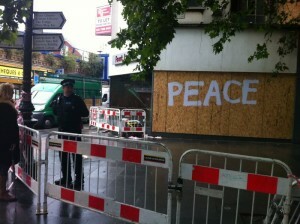 As my picture pleads: Brixton needs peace. Real peace.